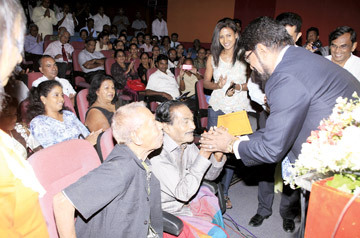 A celebration marking the 42nd anniversary of the National Film Corporation and the 67th anniversary of Sinhala cinema, was held at the National Film Corporation (NFC) premises on a grand scale, with Mass Media and Information Minister Dr. Keheliya Rambukwella as the chief guest. Ministry Secretary Dr. Charitha Herath was also present. The participants of the ceremony were treated with three films at the Film Corporation theatre directed by B.A.W. Jayamanna, the director of Sri Lanka's first talking film 'Kadawuna Poronduwa,' as a tribute to the artiste. The films screened were 'Kapati Arakshakaya', 'Sangawuna Pilithura' and 'Hadisi Vivahaya' sponsored by Tissa Nagodawithana. The book, authored by Ajith Galappatti 'Hathalis Hathe B.A.W. Cinema Meheyuma,' was also launched as a National Film Corporation publication. Veteran actor Boniface Fernando, who appeared in the silver screen from the 1950s till the late 70s, was felicitated with a memento and a cash prize sponsored by the NFC. Fifteen retired artistes of the bygone era whose names were included into the artistes' pension scheme, in recent past also received their pensions at the ceremony. Addressing the gathering, Minister Rambukwella said he was positive that local cinema would reach dizzy heights in the next six months. 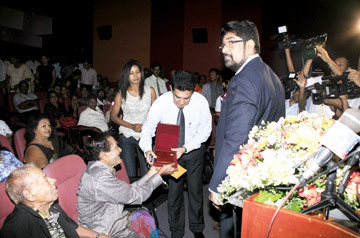 Media Ministry Secretary Dr. Charitha Herath presents a memento to the artiste. "The era when the cinema was on the verge of collapse, is now over. We could cruise a long way under the guidance of President Mahinda Rajapaksa," he said adding, the digitalization system of cinema is in progress. He said the government targets to establish 300 theatres islandwide. The Film Corporation Chairman Asoka Serasinghe said Sri Lankan cinema is now in its 'Diamond era' as there is great progress in the Sri Lankan cinema under the leadership of President Mahinda Rajapaksa. "The development of cinema is gauged by the number of films made and the investment. In the 70s, there had been little competition and films were made with loans obtained from the Corporation," he said. He pointed out that a lot of films have been produced with private investments now, without loans from the Corporation. "There is great revival compared to the 70s era. We are also at a historical transitional period from the 35mm celluloid to a fully digital format. This is why I say, now it is the cinema's diamond era," Serasinghe said.